Use this map to find the location for all of the exciting events, booths, projects, food, and more! Are you interested in helping out? Click on the button below to get more details. This event is open to everyone with an interest in Science, Technology, Art, Engineering, and Math. Student, parent, community member, professional, hobbyist, innovator, creator. Young and old, we welcome you all! DO I NEED TO STAY THE WHOLE DAY? Nope! You can come and go as you please throughout the day. 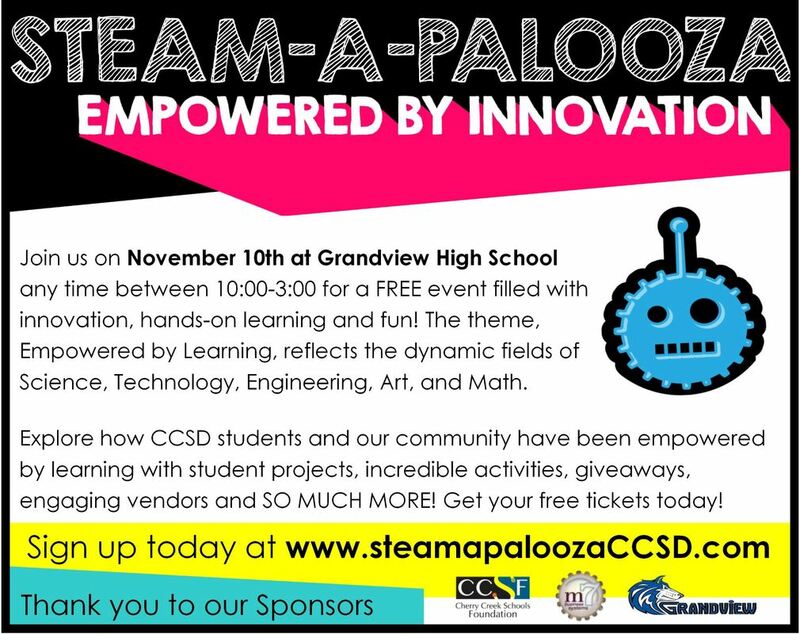 Check the schedule to find out when events are taking place during STEAM-a-Palooza. All children must be supervised by a adult during the event. There will be food for sale in the cafeteria at Grandview High School. You can also bring in your own food and drink to enjoy in the cafeteria during the event. Free parking is available as space permits at Grandview High School. There will be two entrances to STEAM-a-Palooza: the North doors near the cafeteria (facing Arapahoe Road) and the South doors (main entrance near the ballfields). Changing weather can always be an issue in Colorado. If inclement weather impacts the event, you will receive a notification through the email address you used to register for tickets.